creative savv: I am ready for BBQ season! I am ready for BBQ season! Wednesday morning was a chilly one in our house this past week. 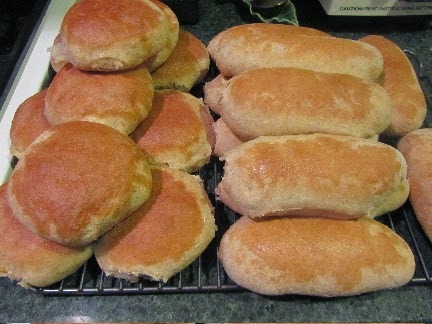 To warm things up, I started a large bowl of roll dough, and made enough hamburger and hot dog buns for 4 family BBQs/cook-outs. Now, I just have to wait for the weather to warm up! Sometimes, I get a bit ahead of myself. Oh well, they'll keep in the freezer until the weather cooperates. Awesome planning ahead! Can you share your roll recipe? TIA! Now I just have to wait for the rain to go away! The other day, I made double what this recipe yields, starting with 3 cups of water/4 teaspoons yeast. Buttering the tops right after baking improves both the flavor and color, IMO. Enjoy! It looks like this coming weekend will be a dry one for us! Better stock up on briquettes! My hubby cooked burgers on the grill last week (we have a charcoal grill so the weather needs to be pretty mild for this to be successful--yay!!!!!!!!!). Our store-bought buns didn't look nearly this tasty! He made chicken on the grill tonight. My kids are riding their bikes ... bring on spring! Oh yum! Lucky you! Enjoy the wonderful weather!